Anao, Tarlac: The First Unang Aklat Municipality — Adarna Group Foundation, INC.
Anao, Tarlac is known as the Ylang-Ylang Capital of Tarlac. With its total land area of 2,387 hectares, this fifth-income municipality is the smallest in the province and is known for the ylang-ylang flowers it grows. For the Adarna Group Foundation, Inc., it has the added distinction of being its first Unang Aklat municipality. AGFI first got to know Anao during the term of Mayor Ed Felipe. In its early years in Anao, AGFI launched its Unang Aklat Program and helped set up the municipal library. As Mayor Felipe’s term drew to a close, it was not clear whether the AGFI-Anao partnership would continue. As it turned out, the partnership not only continued but became stronger. On November 18, 2016, Mayor Betty Lacbayan signed a Memorandum of Agreement for Anao to be an Unang Aklat municipality. 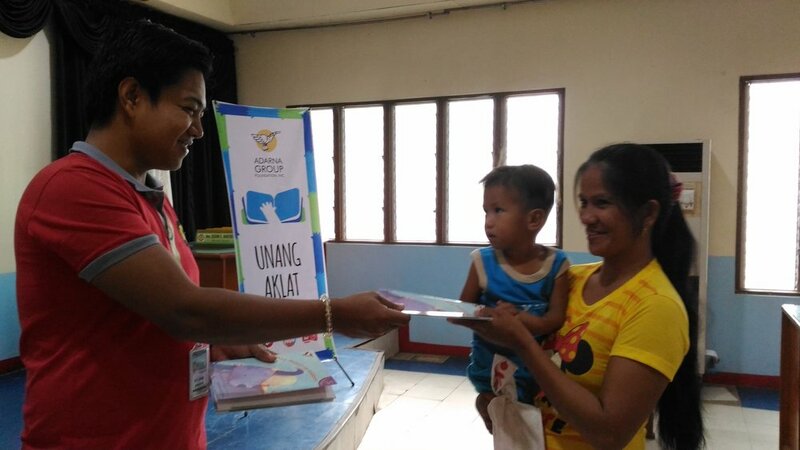 This meant that all the babies of Anao would be part of the Unang Aklat program, the Barangay Early Literacy Program would be held for Anao’s various communities, Read sa RHU which gives out free book pockets and books as well as storytelling sessions would be carried out in its barangay health stations, and Unang Aklatan, a corner for an early literacy book collection, would be set up in the municipal library. Mayor Ed and Mayor Betty have both explained that their support for AGFI stems from their observations that many kids in the Dolores Ongsiako Central Elementary School have a difficult time reading. But even with the support of the two mayors, AGFI would not have succeeded in Anao without Joey Astrero, the tourism officer of the municipality. A nurse by training, Joey has stewarded the work of AGFI in Anao since AGFI first stepped foot in the municipality. It was Joey who asked Mayor Ed how Unang Aklat could cross over to Mayor Betty. And it was also Joey who explained to Mayor Betty the merits of the AGFI partnership and why it should continue to gather the support of the local government unit and its rural health unit. His involvement in the municipality’s nutrition project had convinced him about the importance of focusing resources on thechildren of Anao. Anao is Joey’s hometown. Although he left Anao for his high school and tertiary studies, and even tried working out in Metro Manila after his graduation, he decided he wanted to live in Anao because he loves the municipality. He expresses this love through his commitment to the different projects assigned to him. Newer PostWhat it Takes to Be First: From Adarna House to Adarna Group Foundation, Inc.